Few of you know that besides my family’s passion for grapes, we also like olives. In fact, we like them so much that we have 20 hectares of organic olive trees. Although they require a lot of work, the good part is that the busiest time in the olive fields does not coincide with busy time in the vineyards. July is very busy in the olive trees because at that time the weeds are drying out as they can’t resist high temperatures and we have to remove them to avoid fires. Also December/ January is busy due to the harvest. And that is what I would like to share with you, the end of the olive harvest! We made a total of 4,112 liters of olive oil out of 21,478 kg of olives. 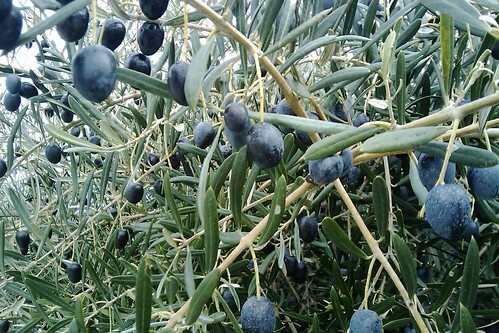 The olives in the photo were waiting to be harvested. Until early last decade, we used sticks to bet on the branches and make the olives fall. But afterwards we adopted a vibrating machine to collect the olives. Check this video out about olive harvest with vibrating machine if you don’t know what I am talking about.